US. The G1 will be available in the US from October 22. Existing US T-Mobile subscribers can register to upgrade their phone via the T-Mobile website as of now. UK. "Early November" is the date to watch if you're in the UK, you can register your interest with T-Mobile to be alerted with updates as we get closer to that date. Europe. European users will need to wait until "early in Q1 2009"
US price is $179, with the choice of $25 or $35 per month plans for 2 years. The $35 plan includes some text messenging allowance. Both include unlimited data. No pricing was given for the UK or European launches,though TechCrunch is reporting it will be free with a £40 / month plan. Word from T-Mobile is that the phone won't be available un-locked, but that's likely to become a moot point pretty shortly after launch. Presence. Instant messaging presence is fully integrated directly into the contact manager and Gmail. Backlit Keys. The keys on the handset are all backlit so you can use it in the dark. Gmail. You need to have a GMail account to use the phone. Once you're signed in, this will be used to authenticate with all Google services you use. Can it be Used as a Modem?. No. Well not out of the box anyway. Look out for a 3rd party app to do the job. MS Exchange?. Not native. The official response is that this is an "opportunity for a 3rd party developer". Office Support?. Yes. The phone will read Word, Excel, and PDF files natively. Push Email? Yes for Gmail, standard POP/IMAP for everything else. Desktop Sync. No. The idea is to sync everything with the cloud rather than a desktop application. Contacts sync with GMail, calendar entries with Google calendar, etc. Bluetooth. Profiles for Bluetooth headset are currently supported. Everything else if v2. International support. Dual band 3G and quad band GPRS makes it compatible with most countries. Exactly which applications will ship with the first handset is still something of a mystery, but we were given a peak at some of the likely inclusions. The native Google apps are listed at the Android mobile site. GMail. Strangely wasn't demo'ed, but will be partially web-based as it's build using Android's WebView classes. Amazon MP3 Store. Amazon have provided a native iTunes rival that lets you purchase DRM free music from the Amazon MP3 store direct from your mobile. You need to be connected to WiFi to download tunes. Music Player. Looks like the player used in the emulator. Not demoed in detail but looks solid (if no iPod killer). Android Marketplace. You can download and install new Android applications using the native marketplace app. You can also install apps from other web sites, using the SD card, or the USB sync cable. Maps. Google Maps is a killer mobile application. As well as the features already available on iPhone, WinMo, and Blackberry, the Android version supports Streetview that uses the phone's compass to automatically rotate your orientation. YouTube. Wasn't demo'd, but as you'd expect. Search. Context sensitive search will search depending on what you're doing (contacts, map, web, etc.). The device has a dedicated 'search' button. Talk. GoogleTalk instant messaging and presence is available. Looks pretty basic, but that's what you want from a mobile IM client. Contacts. The contact manager as shown in the SDK emulator. Features presence and auto-sync with Gmail contacts. 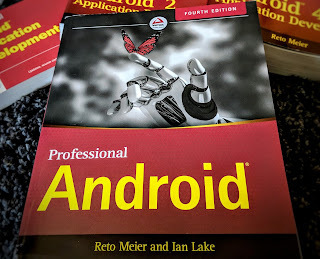 If you're interested in developing your own Android applications, my new book -- Professional Android Application Development -- will be available on Amazon from November 17. Today G1 Mobile Phone has been a demand of the day. Its features make it the king of all mobile phones in the market today. As per the records mobile phone has become necessarily for life and if we talk about which is the best Mobile Phone then it’s the Google’s Android that is counted first.